In talking about their engagement session, Jill asked me if I had any tips on how to be more natural in photographs. I gave her some ideas, but I’ll be honest - they didn’t need them. 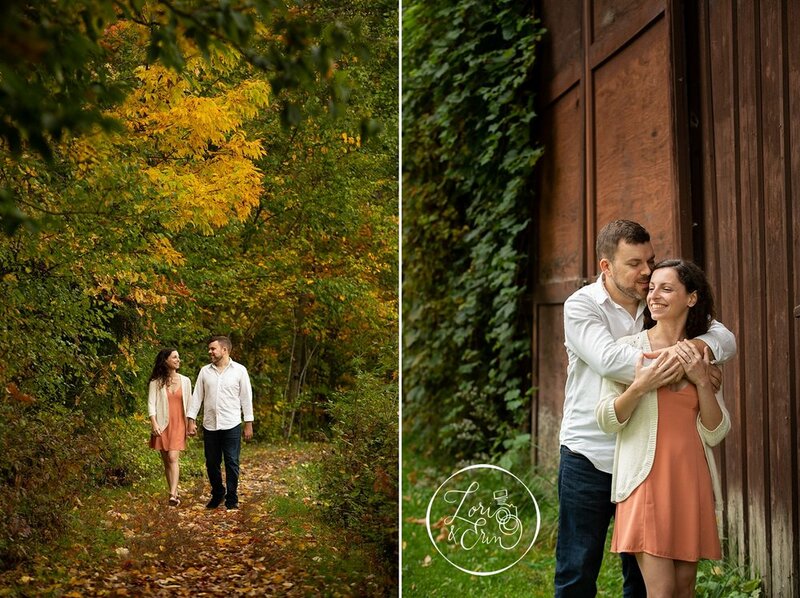 From the very start at their engagement session at Highland Park, Jill and Travis were perfection. Laughing, snuggling, and more laughing. 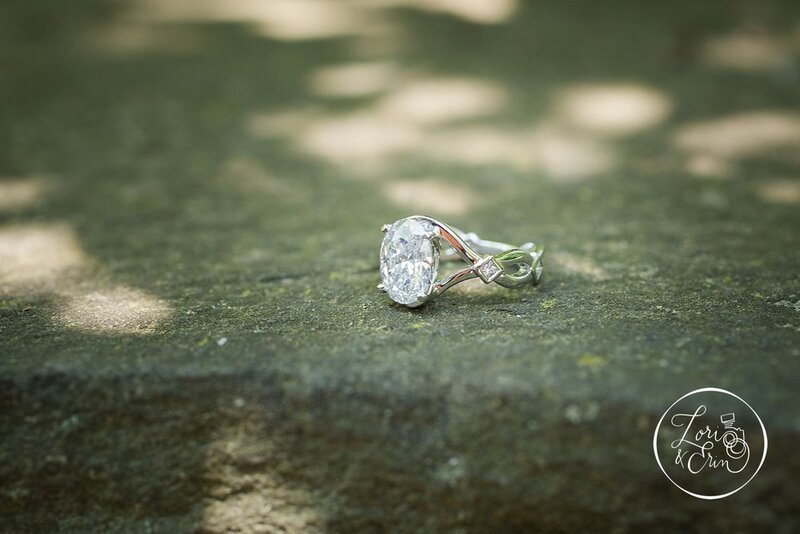 Perfection despite the bone chilling temperatures that often accompanies a winter engagement session. After a stop at the park, we hit up the rooftop at the Genesee Brewhouse. The wind was chilly, but they danced and flirted, and laughed some more. They bring out each other’s silliness, which is exactly their natural state. I’m already looking forward to their wedding day, just to see them laugh again. Their perfect evening is a good beer and sitting home together playing video games. Everyone has their thing together, and for these two it’s gaming. 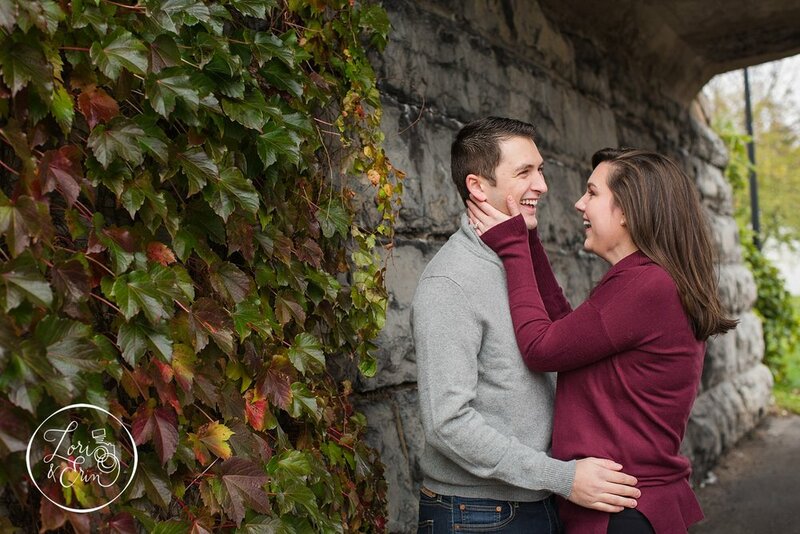 Naturally, the first idea that came to mind for their engagement session was heading downtown in Rochester for an engagement session at The Playhouse. Conveniently, this was also where they had their first date. It was super perfect - from skee ball to Teenage Mutant Ninja Turtles. They laughed and played and fake pouted when the other person beat them in a game. Along the way, we photographed who they really are as a couple. After a drink and some games, we headed outside to Highland Park for a quick outdoor portion to their session. It was cold, but the light was perfect and they kept each other warm. 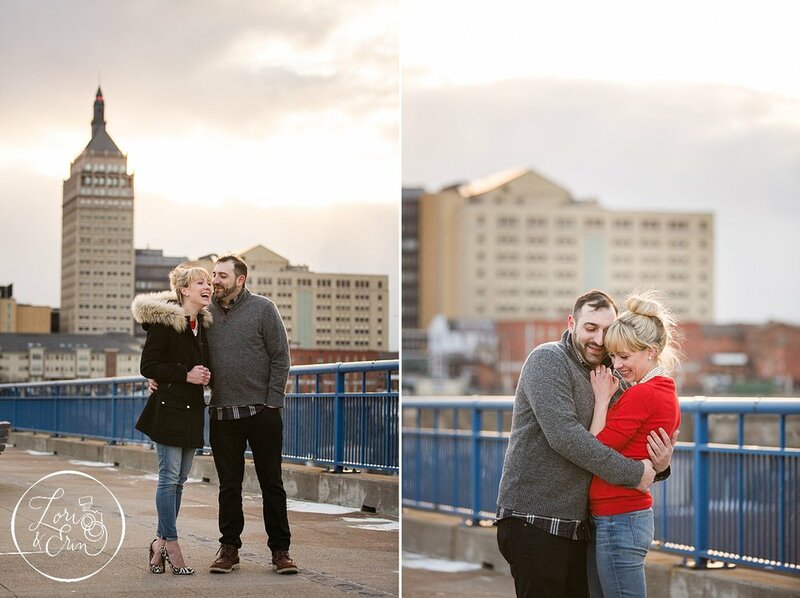 We’re loving these Rochester winter engagement sessions lately. It seems to be making a come back, and we’re all for it! 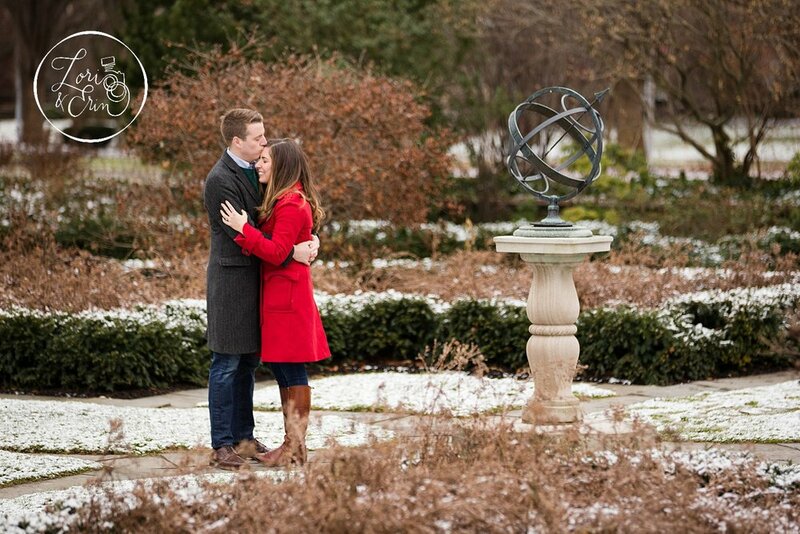 Believe it or not, with a little snow on the ground a winter engagement session can be just as beautiful as any other time of the year. We’re so glad that Kyra and Alex were up for the challenge while they were home for the holidays. Kyra’s smile widened every time she looked up at Alex. Cuddling close (and a warm cup of coffee) helped to ease the cold in their extremities at their engagement session in Rochester NY at the Eastman Museum. Her red coat gives the images a perfect pop of color and was a great outfit choice for an engagement session during the holidays! 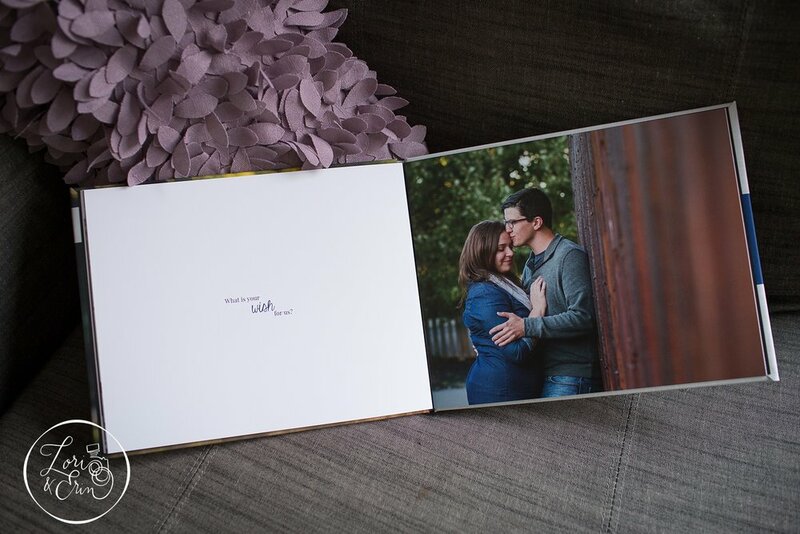 As our fifth year as Lori & Erin Photography comes to a close, we’re again feeling grateful. We’re grateful for your trust in us and for your genuine personalities. We’re grateful for your love and your families. Your relationships are what we’re all about. They fill us up and keep us coming back for more. Without further ado - here’s a glance back at all of the fun we shared with you this year. We can’t wait to see you again this year! 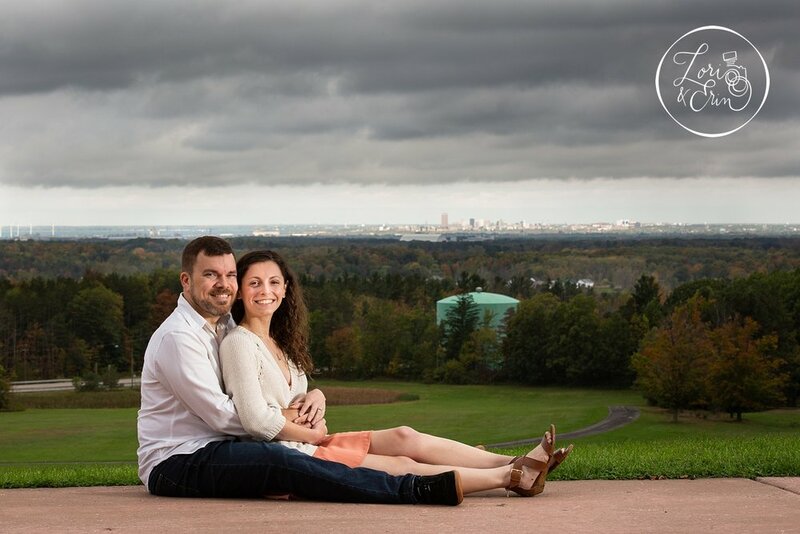 I’d never been to Chestnut Ridge Park in Orchard Park, but it was the perfect setting for some early fall engagement pictures. Jesse and Kristen initially told us they were awkward in photographs. I couldn’t disagree with that statement more. They were fun, sweet and lovable from start to finish. I’ll never know what Jesse whispered in Kristen’s ear to make them laugh so hard, but it was worth it. These two fit so perfectly together, and are exactly the kind of couple that makes us so excited to do what we do year after year. 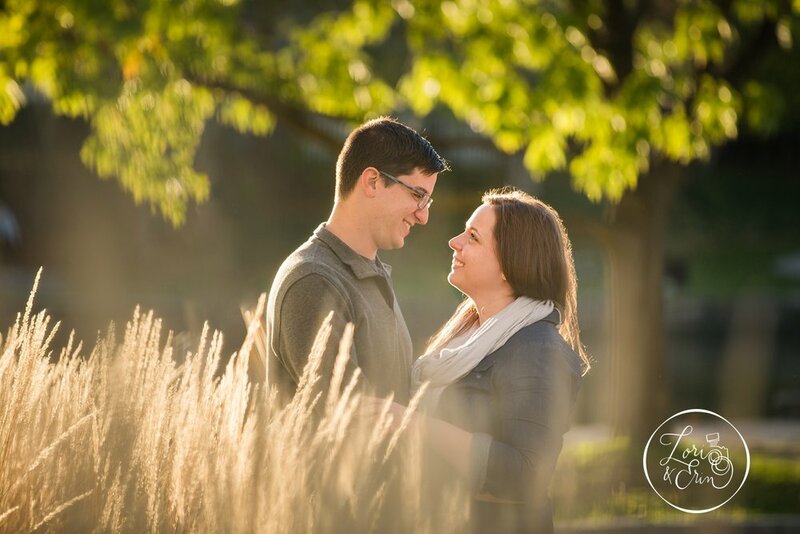 I’m already so excited for their Finger Lakes Wedding day at Ventosa Vineyards next July. Until then, send these two some love! But enough about their puppy, Larry. We've been looking forward to this engagement session for a lonnnngg time. I think they have been too. They waited for the summer (it's their favorite time of year) to come and for their goldendoodle puppy to be ready. But before all that, they waited for each other. Because of the wait, Christina and Adam are a perfect fit together. They're both educators. They're smart, sensitive and funny. They remember down to the aisle (18a in Wegmans) where they had their first kiss on one of their first dates. We thought it'd be funny to recreate that scene, but Corbett's Glen, where they got engaged, won out. It was such a fun morning with the three of them. We mostly laughed at Larry and his super cute playfulness. 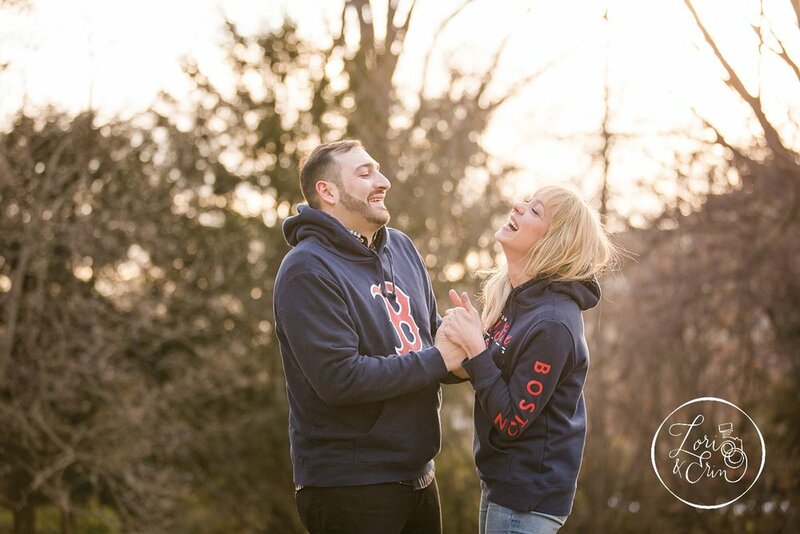 It was hot and humid for an engagement session in Penfield NY, but you'd never know it from looking at their awesome expressions and love. Congratulations Adam and Christina, we're so happy that you've found each other, and cannot wait to be part of it all with you! If you're about to propose to your significant other, take notes. John Luke has that milestone mastered. I mean, wow. Photographing a proposal was new to me until now. It's been a bucket list session type for me, so when John Luke called and told me his plans I could not wait. He reserved the space at the Sunken Gardens, and planned an "art show" called Grounded Garden for his fiance to be, Nicolette. He had created seven paintings, which follow along the seven Chakras, and also were significant moments in their relationship. He had music, mimosas, and even a fake brunch reception that made the whole plan believable. I have to admit, playing my role as the "event photographer" was a little scary, but my minimal acting skills were on point that day. Even as Nicolette commented on the the artwork, she never saw it coming until he got down on one knee. It was soooo beautiful. Despite the 98 degree weather, it was a beautiful moment to capture for these two. I can't wait to see where their love takes them next as they plan their future together. Congratulations Nicolette and John Luke! On their wedding day Larry is most looking forward to seeing Sara walk down the aisle. Sara can't wait for the reception. Together, they're excited about all of it. They love to travel. I loved hearing the story of how they got engaged in Santorini, Greece. What an amazing adventure and awesome story to remember! They're also a little bit silly together, which showed in all of the laughter at their engagement session a few weeks ago. There's really nothing I love to capture more than a couple laughing together. The laughter is real and beautiful, even if the joke was awful. 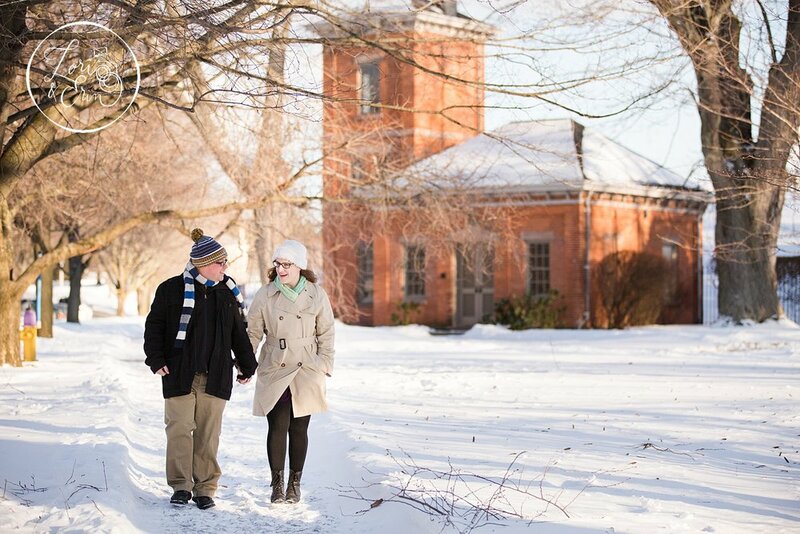 We had hoped for a warmer day, but at a February engagement session in the Finger Lakes, we'll take anything above freezing temperatures. After venturing out onto the grounds at Belhurst, we stopped by the tasting bar for a chocolate and wine tasting to warm back up. It was the perfect way to end an afternoon with them, and a great way to get us all excited for their September wedding at Ventosa Vineyards. Enjoy and bit of our time together - and feel free to leave Sara and Larry some well wishes for a fantastic wedding day! Engagement sessions (in any season) are my favorite type of session. I'm pretty sure I've mentioned that fact before. I love their peacefulness or playfulness and always their love - without the timeline of a wedding day. 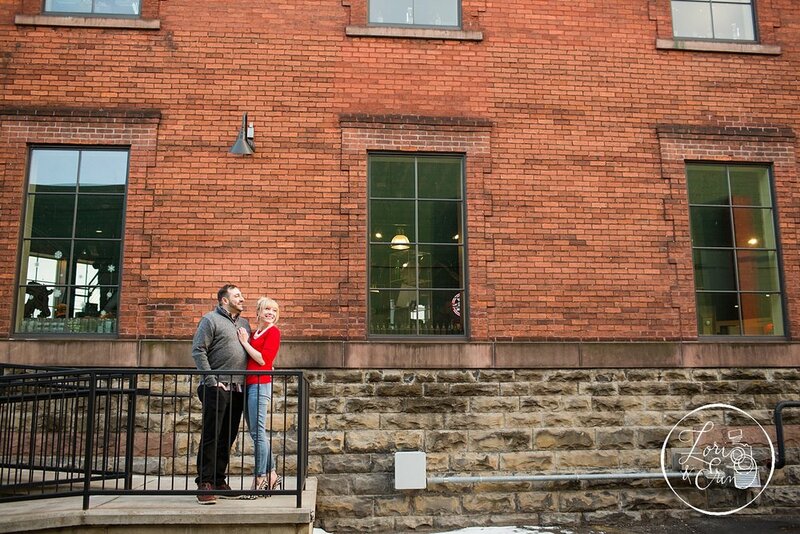 We've photographed engagements anywhere from Letchworth State Park to downtown Rochester NY, and even in local coffee shops like Starry Nites Cafe or Joe Bean on University Avenue. Each one is unique and personalized to our couple. But the one question we always get asked is - what should we do with these images? Answer: let's make a book! But this isn't just any old Shutterfly book. Yes, it's a story of you, and who you are as a couple - but you can do more with it. 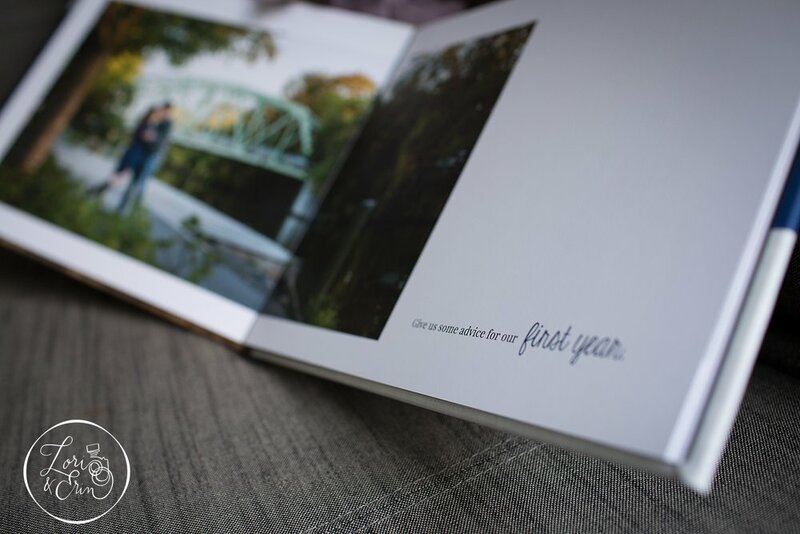 One of our most popular ideas, is to incorporate the book at your wedding as a guest book. 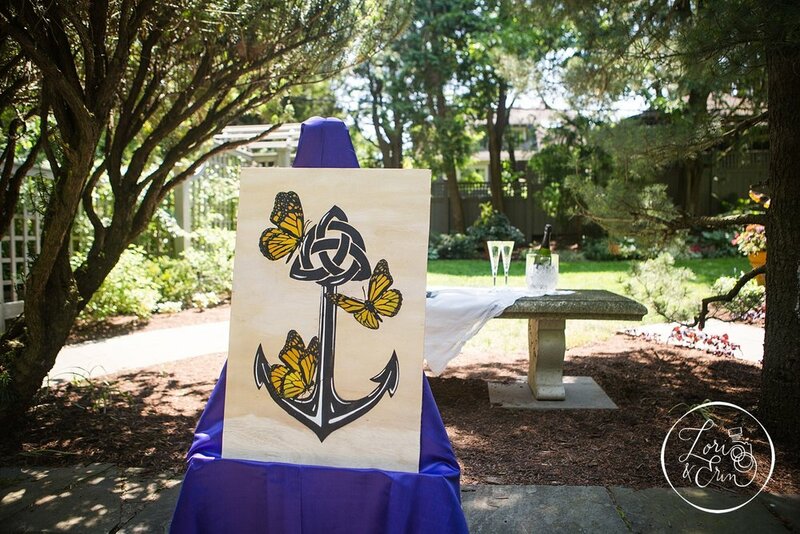 These days, thanks to Pinterest, there are thousands of ways to display a guest book concept. Crafty people love coming up with new, never seen before ways to mark the occasion. But we love this book because it allows your guests to leave you notes, and answers to questions about love and marriage. Bonus point - there's no glue gun or mason jars involved, because we do all of the hard work for you. It shows not only who you are as a couple, but also how much you're loved by those who joined in your wedding day. So - what would you like to do with your engagement session photographs? 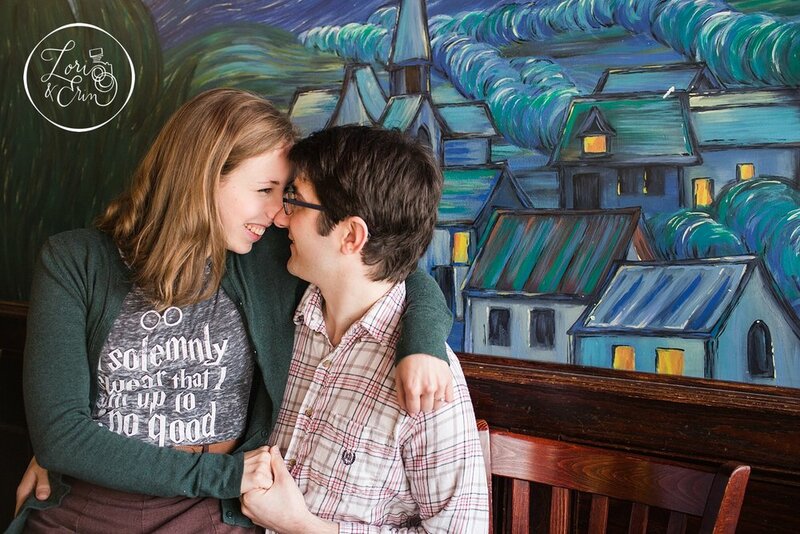 When they told me that they'd gotten engaged during a "Harry Potter Festival," I knew we'd fit together well. And we did. We met up at Starry Nites Cafe on University Ave for some cuddles and coffee (them, not us). Then we headed towards the Memorial Art Gallery for a few snow scenes and even a little "snow juggling." Though, if I'm honest, planning their dead-of-winter engagement session to include coffee BEFORE we went outside to play was not one of my finer decisions. Despite that faux pas, I think they still like us. Because even with frozen fingers we had so much fun. I was looking forward to their October wedding before. But now, I can't wait! 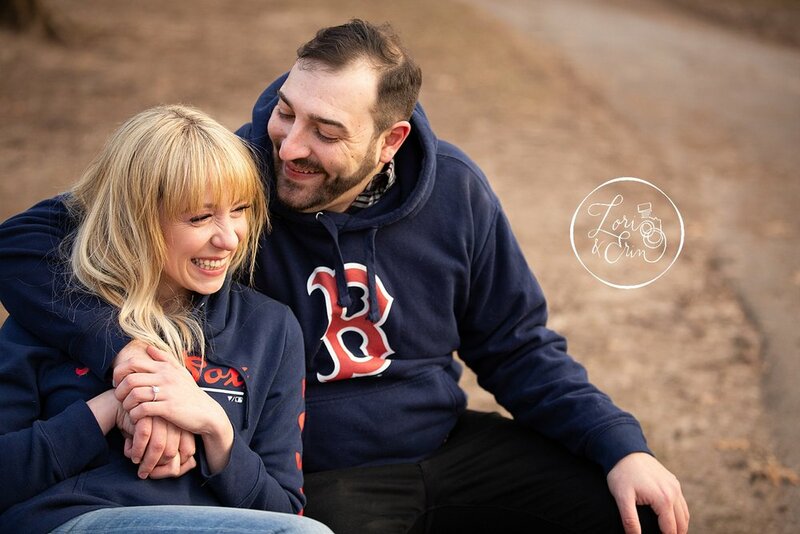 Shortly after we scheduled their engagement session a freak hockey accident rescheduled it. Then, after rescheduling it once, the weather left us with less than desirable conditions for November session. But we persevered and finally the stars aligned. The rain held out for a few hours while Zach, Kate, Lori and I ventured out in the cold in search of what was left of the fall colors in Fairport. They met in nursing school. They love try new things together - everything from cooking to sports. And while they have a different definition of what might be fun, they laugh about it together - a lot. That's actually one of the reasons I loved their session so much. There's something so perfectly real about being able to capture a couple laughing together. It just never gets old for me. I know they'll be able to laugh together like this always. These two - oh man, what a gorgeous night we spent together at Schoen Place. Michelle and Steve are so great together. The evening light fell on them perfectly as we wandered along the canal. Photographing them just felt so easy and made us smile. They have this quiet way about them that felt so sweet and comfortable. It's like a "putting on your favorite pair of jeans and cozy sweater" kind of comfortable. They're at home together, and it's just perfect. We can't wait to see them again - their big day can't come soon enough!